Last Sunday the people of Clairemont were treated to a spectacle usually only reserved for a galaxy far, far away. 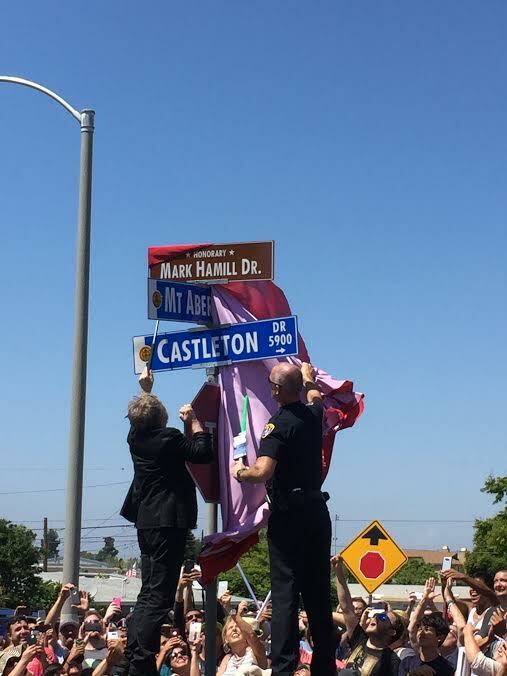 Mark Hamill, thee Mark Hamill, Luke Skywalker rode in to town as the 5900 block of Castleton Drive was being renamed in honor of the one time resident. It was quite the event, and dare I say anyone who was anyone in Clairemont was in attendance. I myself grew up off Genesee and Balboa, and like most of its residents we figured it was just an Urban Legend that Mark Hamill had lived there. Well, Urban Legend confirmed. 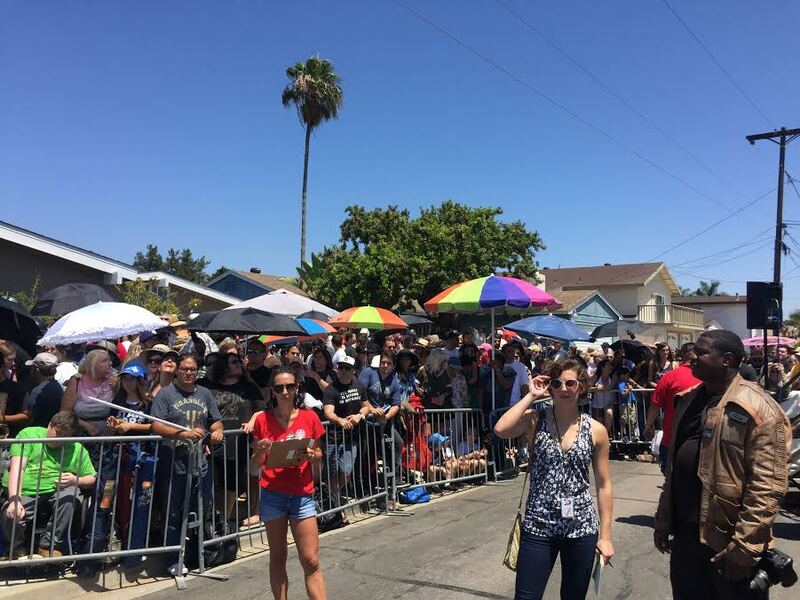 Hundreds of fans, locals, and San Diegans gathered at the closed off street as Star Wars music played over the PA system. Cosplayers were out in force, and members of the local media found it difficult to hide their inner-fanboy, wearing costumes and asking for a quick selfie when the chance arose. District 6 councilmember Chris Cate was the ringleader of the event, but it wasn’t his initial idea. “It came 100% from the residents of Clairemont. We were fortunate enough to work with them to make it a reality.” When the declaration was made just a few weeks ago, Mark Hamill had no idea. Cate tweeted out the event, and Hamill actually responded in shock and gratitude. “Getting that first tweet reply from Mark Hamill, and the subsequent conversations were completely surreal. During it all he was gracious, and sincere in his love for Clairemont and San Diego.” Cate said. I couldn’t agree more. Mark Hamill made sure he was there for the ceremony, and even brought most of his family with him, including his two rescue dogs Millie and Mabel. He entered the stage to thunderous applause, and when he took the mic was treated to shouts of “We love you!” and “Welcome home!” from the crowd. Hamill responded to every call-out with genuine appreciation. Hamill talked about growing up all over the country, as his dad was a Naval officer. “I spent the most time right here on this street, from eight years old to twelve. I used to put on puppet shows for neighbors, and ride my bike down to the library. I’ve always wanted a place I could call my hometown, and that’s what you’ve all given me today – a place to call home.” The crowd erupted. The media erupted. I erupted. His comments were sincere, kind, and we could all feel it. Hamill then participated in a pre-determined Q&A, during which the host, KUSI’s Lisa Remillard, suggested he face the cameras. Hamill replied, “But my fans are all this way!” Pandemonium. What followed was an extremely comical street sign unveiling in which they couldn’t get the curtain off the sign. A police officer got on stage, handed Hamill his nightstick so he could try and push the curtain off, then the officer was handed a lightsaber using that to displace the curtain. People were shouting at the officer to give the lightsaber to Hamill, but he never did and I’m almost positive the audience wouldn’t have been able to contain themselves if he had. After the curtain finally dropped, Councilmember Cate presented Hamill with a framed proclamation hereby declaring July 30th, 2017 as Mark Hamill Day in the City of San Diego. When Hamill left stage he immediately went to the fans and started taking photos, singing autographs and shaking hands. He spent a good thirty minutes interacting with fans and they loved every second of it, and it honestly looked like Hamill did as well. It was fun. It was honest. It meant something good to everyone involved. It was exactly what this city needed. A true Jedi through and through.